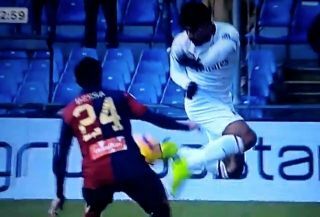 AC Milan secured a 2-0 win over Genoa on Monday afternoon, with Lucas Paqueta catching the eye with this bit of cheeky skill. The 21-year-old made his third consecutive start for the Rossoneri since joining them this month from Flamengo, as he continues to impress and prove to be a sensible addition. Evidently by securing his place in Gennaro Gattuso’s starting line-up immediately, he has settled well in Italy and is looking to make his mark for the Serie A giants. With playing time comes increasing confidence, and based on the clip below, he looks as though he isn’t short of it as he produced a brilliant flick over his marker’s head to get himself out of trouble. The Brazilian international almost played himself into a bigger spot of bother as he gave away possession immediately after the flick, but fortunately for him Genoa didn’t take advantage and Milan returned home with all three points. Time will tell whether or not he goes on to have a major impact for the club in the coming months to help them secure Champions League qualification, but he could seemingly be set to bring plenty of flair and class to their midfield.